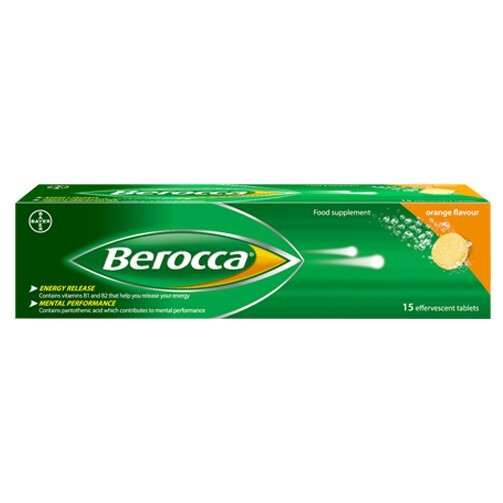 Berocca is a high dose formulation of B and C vitamins plus other essential minerals. These key nutrients work in synergy to help you to perform at your best and get the most out of the day ahead. Berocca is free from artificial stimulants so offers a healthy way to help you stay on top form both physically and mentally. Ingredients when ready to drink. Citric acid, Sodium hydrogen carbonate, Vitamin C, Magnesium sulphate, Mannitol, Calcium carbonate, Magnesium carbonate, Flavourings, Sodium carbonate, Niacin, Sweeteners (Acesulfame K, Aspartame), Salt, Zinc citrate, Colour (Beetroot red, Beta carotene), Pantothenic acid, Malt dextrin, Riboflavin, thiamin, Acacia gum, Vitamin B6, Partially hydrogenated soybean oil, Sugar, Trisodium citrate, Anti-foaming agent (polysorbate 60). Folacin (folic acid), Antioxidants (Alpha-Tocopheryl, sodium ascorbate), Biotin, Citric acid, vitamin B12. Contains a source of phenylalanine. Free from artificial preservatives. Berocca does not contain yeast, gluten or lactose. Desiccant enclosed in cap. Adults and children over 12. Take one tablet per day dissolved in a glass of water to make a delicious orange flavoured effervescent drink. Berocca is best taken first thing in the morning to make the most of the day ahead and can be taken every day throughout the year.